As of 2008 clinical research at the University of Minnesota has included a bone marrow transplant to a 2-year-old child who is one of 2 brothers with EB. The procedure was successful, suggesting that a cure may have been found. A second transplant has also been performed on the child's older brother, and a third transplant is scheduled for a California baby. A clinical trial is planned for 30 subjects. However, the immune suppression that bone marrow transplantation requires causes a risk of serious infections with large scale blisters and skin erosion. Indeed, at least four people have died in the course of either preparation for or institution of bone marrow transplantation for epidermolysis bullosa, out of only a small group of patients treated so far. A pilot study performed in 2015 suggests that systemic granulocyte-colony stimulating factor (G-CSF) may promote increased wound healing in people with dystrophic epidermolysis bullosa. 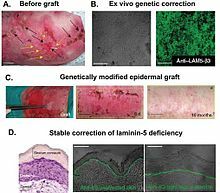 Transplanting skin derived from genetically modified stem cells onto the wound surfaces has been studied with a report of improvements in one person. In 2014, Pearl Jam lead vocalist Eddie Vedder together with his wife Jill McCormick co-founded the EB Research Partnership, a non-profit organization dedicated to finding a cure for epidermolysis bullosa. McCormick was childhood friends with Ryan Fullmer, whose son, Michael, was born with EB. Vedder, McCormick, Ryan Fullmer, and his wife, Heather founded Heal EB. In 2014, they merged Heal EB with the Jackson Gabriel Research Foundation to create the EB Research Partnership. The EBRP hosts several annual fundraising events. To date, they have raised $12 million to fund research to find a cure. On March 1, 2019, heavyweight boxer Luis Ortiz was named an honorary ambassador for the EB community by the EB Research Partnership. Ortiz's daughter, Lismercedes, was born with epidermolysis bullosa. The condition was brought to public attention in 2004 in the UK through the Channel 4 documentary The Boy Whose Skin Fell Off, chronicling the life and death of Jonny Kennedy, an Englishman with EB. In the United States, the same could be said of the HBO documentary My Flesh and Blood from 2003. Additionally the film, Butterfly Girl, follows Abigail Evans with the disease. In Canada, The Sports Network's award-winning documentary on Jonathan Pitre led to extensive coverage on the boy's disease, treatment, and death. ^ Fine, Jo-David; Hintner, Helmut (2009). Life with Epidermolysis Bullosa (EB): Etiology, Diagnosis, Multidisciplinary Care and Therapy. Springer Science & Business Media. p. 242. ISBN 9783211792711. ^ a b c d e f g h i j k "Epidermolysis bullosa". rarediseases.info.nih.gov. Retrieved 16 May 2018. ^ a b "Epidermolysis Bullosa". National Institute of Arthritis and Musculoskeletal and Skin Diseases. 11 April 2017. Retrieved 16 May 2018. ^ a b c "Epidermolysis Bullosa". National Institute of Arthritis and Musculoskeletal and Skin Diseases. 11 April 2017. Retrieved 16 May 2018. ^ a b c d e f g h i j k Tabor, A; Pergolizzi JV, Jr; Marti, G; Harmon, J; Cohen, B; Lequang, JA (May 2017). "Raising Awareness Among Healthcare Providers about Epidermolysis Bullosa and Advancing Toward a Cure". The Journal of Clinical and Aesthetic Dermatology. 10 (5): 36–48. PMC 5479476. PMID 28670357. ^ Koshida, S.; Tsukamura, A.; Yanagi, T.; Nakahara, S.; Takeuchi, Y.; Kato, T.; Tanaka, T.; Nakano, H.; Shimizu, H. (2013). "Hallopeau-Siemens dystrophic epidermolysis bullosa due to homozygous 5818delC mutation in the COL7A gene". Pediatr Int. 55 (2): 234–7. doi:10.1111/j.1442-200X.2012.03638.x. PMID 23679163. ^ "Junctional epidermolysis bullosa". Genetics Home Reference. NIH. Retrieved 11 October 2013. ^ Varki, Roslyn; Sadowski, Sara; Uitto, Jouni; Pfendner, Ellen (2007-03-01). "Epidermolysis bullosa. II. Type VII collagen mutations and phenotype–genotype correlations in the dystrophic subtypes". Journal of Medical Genetics. 44 (3): 181–192. doi:10.1136/jmg.2006.045302. ISSN 0022-2593. PMC 2598021. PMID 16971478. ^ McGRATH, J.a. ; Schofield, O.m.v. ; Eady, R.a.j. (1994-05-01). "Epidermolysis bullosa pruriginosa: dystrophic epidermolysis bullosa with distinctive clinicopathological features". British Journal of Dermatology. 130 (5): 617–625. doi:10.1111/j.1365-2133.1994.tb13109.x. ISSN 1365-2133. ^ Kerns, Michelle L.; DePianto, Daryle; Dinkova-Kostova, Albena T.; Talalay, Paul; Coulombe, Pierre A. (2007-09-04). "Reprogramming of keratin biosynthesis by sulforaphane restores skin integrity in epidermolysis bullosa simplex". Proceedings of the National Academy of Sciences. 104 (36): 14460–14465. Bibcode:2007PNAS..10414460K. doi:10.1073/pnas.0706486104. ISSN 0027-8424. PMC 1964870. PMID 17724334. ^ Josephine Marcotty (2008-07-03). "Long-shot stem-cell treatment gives two brothers a future". Star Tribune. Retrieved 2008-07-22. ^ a b Souillet, G.; Guffon, N.; Maire, I.; Pujol, M.; Taylor, P.; Sevin, F.; Bleyzac, N.; Mulier, C.; Durin, A. (2003-06-10). "Outcome of 27 patients with Hurler's syndrome transplanted from either related or unrelated haematopoietic stem cell sources". Bone Marrow Transplantation. 31 (12): 1105–17. doi:10.1038/sj.bmt.1704105. PMID 12796790. ^ Fine, Jo-David; Manes, Becky; Frangoul, Haydar (July 2015). "Systemic granulocyte colony-stimulating factor (G-CSF) enhances wound healing in dystrophic epidermolysis bullosa (DEB): Results of a pilot trial". Journal of the American Academy of Dermatology. 73 (1): 56–61. doi:10.1016/j.jaad.2015.04.015. ISSN 0190-9622. PMID 25956659. ^ Hirsch, T; Rothoeft, T; Teig, N; Bauer, JW; Pellegrini, G; De Rosa, L; Scaglione, D; Reichelt, J; Klausegger, A; Kneisz, D; Romano, O; Secone Seconetti, A; Contin, R; Enzo, E; Jurman, I; Carulli, S; Jacobsen, F; Luecke, T; Lehnhardt, M; Fischer, M; Kueckelhaus, M; Quaglino, D; Morgante, M; Bicciato, S; Bondanza, S; De Luca, M (16 November 2017). "Regeneration of the entire human epidermis using transgenic stem cells". Nature. 551 (7680): 327–332. doi:10.1038/nature24487. PMID 29144448. ^ Development, reliability, and validity of a novel Epidermolysis Bullosa Disease Activity and Scarring index (EBDASI). 2014. Loh CH, Kim J, Su JC, Daniel BS, Venugopal SS, Rhodes LM, Intong LR, Law MG, Murrell DF. January 2014. JAAD, 70, 1pp. ^ Hon, Kam Lun Ellis; Li, Joshua J.; Cheng, Bernadette L.; Luk, David C.; Murrell, Dedee F.; Choi, Paul C. L.; Leung, Alexander K. C. (2015-03-04). "Age and etiology of childhood epidermolysis bullosa mortality". Journal of Dermatological Treatment. 26 (2): 178–182. doi:10.3109/09546634.2014.915002. ISSN 0954-6634. PMID 24724596. ^ "Epidermolysis Bullosa Clinic Frequently Asked Questions". Stanford Medicine — Dermatology. Retrieved 13 April 2018. ^ Marinkovich, MP; Wells, MJ; Perry, V; James, WD; Ortonne, JP (December 3, 2007). "Epidermolysis Bullosa". Bullous Diseases. emedicine.com. Retrieved 2008-07-22. ^ Pfendner, Ellen; Uitto, Jouni; Fine, Jo-David (2000-11-07). "Epidermolysis Bullosa Carrier Frequencies in the US Population". Journal of Investigative Dermatology. 116 (3): 483–484. doi:10.1046/j.1523-1747.2001.127911.x. Retrieved 2008-07-22. ^ Kiernan, Lynda (21 December 2018). "A brave Laois woman is among the guests for tonight's Late Late Show". Leinster Express. Retrieved 21 December 2018. ^ Townsend, Michelle (21 December 2018). "Late Late Show viewers praise Colin Farrell and EB sufferer Emma Fogarty for honest interview". RSVP live. Archived from the original on 22 December 2018. ^ "Luis Ortiz named ambassador for Epidermolysis Bullosa Research Partnership". World Boxing News. March 1, 2009. ^ "Series 1 - The Boy Whose Skin Fell Off". Channel 4. 2004. Retrieved 2009-02-28. ^ Butterfly Girl: Remembering Abigail Evans, The Austinot, January 12, 2015. ^ Andrew Duffy, "TSN documentary on Jonathan Pitre wins screen award". Ottawa Citizen. March 9, 2016. Retrieved 6 April 2018. ^ Ottawa boy Jonathan Pitre dead at 17 from rare skin disease, CBC News, April 6, 2018. ^ Roddy Isles; Head of Press (2005-05-12). "Dundee Scientists on road to cure for "Butterfly Children" condition". University of Dundee. Retrieved 2008-07-22. ^ Suellen Hinde; Health reporter (2006-11-26). "Little girl's life of pain". HeraldSun.com.au. Retrieved 2008-07-22. ^ Robyn Gobert, Past President of DEBRA Australia Inc. (May 2002). "Times change - A family's story about living with EB". e-bility.com. Retrieved 2008-07-22. ^ Gena Brumitt Gruschovnik, DEBRA International Executive Committee. "DEBRA Chile website".